At LifeSaver Training we offer a variety of First Aid courses which are suitable for any type of organisation, whether large or small. All courses are open to individuals and groups. Please click on the title links for further details about each course, it’s duration and any applicable entry requirements. The Level 2 Emergency First Aid at Work (EFAW) programme is ideal for smaller organisations that present few health and safety risks. EFAW training enables a first-aider to give emergency first aid to someone who is injured or becomes ill while at work. The Level 2 EFAW qualification is valid for 3 years. The Level 3 First Aid at Work course takes place over 3 days. FAW training includes EFAW and in addition it equips the first-aider with skills to apply first aid to a large range of specific injuries and illnesses. The Level 3 FAW qualification is valid for 3 years. The Health and Safety Executive strongly recommends that all First Aiders attend an annual Refresher course to keep their skills fresh and up to date. Certificates issued for First Aid at work are valid for a period of three years. First Aiders must attend a requalification course prior to their FAW certificate experation date to ensure their qualifications remain valid. Please note, the annual refresher course mentioned immediately above is not a substitute. The Paediatric First Aid course meets standards necessary for UK based child care providers seeking suitable first aid training. This course meets the requirements for OFSTED, Surestart, NCMA, PLA and EYDCP. The AllergyWise anaphylaxis training course for schools, early years and community settings. 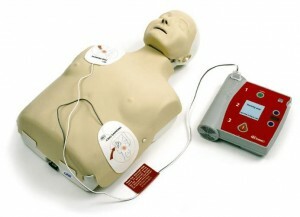 LifeSaver Training offers health care practitioners CPR and AED update training, all our courses conform to current UK & ERC Resuscitation guidelines. This course is suitable for those people working in the health care profession. The course focuses on Primary Care (CPR) skills together with knowledge of how to use an Automated External Defibrillator machine (AED). Successful candidates will be issued with a certificate which is valid for three years. LifeSaver Training holds regular CPR skills review workshops, where attendees can practice their CPR skills under the guidance of one of our highly qualified Instructors. The CPR skills review workshop is open to anyone who holds a current CPR certificate. Candidates receive a certificate of attendance. The HSE provides guidelines to provisioning First Aid at Work. A link to their leaflet in PDF format can be found here.